The World Wide 56Kbps modem desktop Global Premier 56 offers both synchronous and asynchronous data support with throughput up to 230.4 kbps on both dial and Lease line circuits. 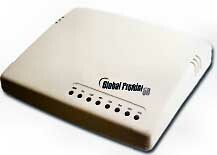 The desktop Global Premier 56 offers both synchronous and asynchronous data support with throughput up to 230.4 kbps. The Global Premier 56 incorporates advanced technology that enhances operation on less-than-ideal transmission lines and higher HTML compression using V.44. Flash controller and Flash DSP RAM for future enhancements and upgrades. AT driven remote configuration allows option settings of a remote unattended modem to be changed over the phone line. Password security denies access to unauthorized users.